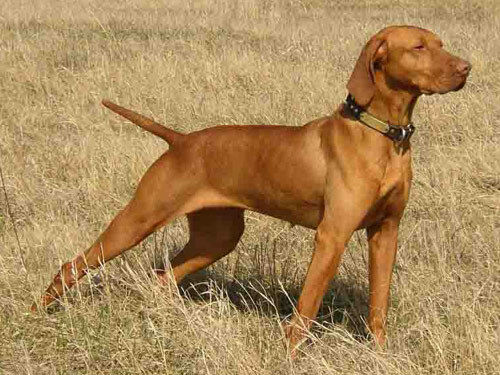 The Vizsla has the ability to act as a partner in the field for hunters all day long. It has a natural talent for hunting and is a skilled pointer. Because this breed is so full of energy, it can become irritable and a menace if it does not have enough physical activity during the day. The personality of the Vizsla depends on the specific dog and can range from moody to passive. Most have a tendency to be kind, warm, and sensitive. At times this breed can be highly protective. The Vizsla is an ideal choice for a person or a family that is very active and likes to spend a significant amount of time outdoors. The major health concern for the Vizsla is epilepsy. There are a few minor health concerns for this breed which include canine hip Dysplasia and lymph sarcoma. On occasion there are several health issues that may affect the Vizsla breed which include progressive retinal atrophy, dwarfism, tricuspid valve Dysplasia, persistent right aortic arch, and hypothyroidism. To keep this breed healthy it is suggested that the hips and thyroid be tested regularly. The average life span of a healthy Vizsla is ten to fourteen years.